A decorative construction that frames the opening of a fireplace. 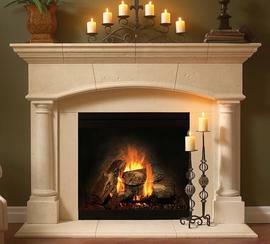 The term "mantel" can also refer to a shelf above a fireplace. There are many options available for mantels, which makes it possible to achieve a wide variety of desired looks. Adding a mantel can increase the installation cost by $800 to $3,000.